This large Maya center stands amidst the high forests of southern Campeche, only 30 km from the Guatemalan border. The archaeological site was first discovered in 1931 by American Biologist Cyrus Lundell while conducting an aerial survey of the region. Based upon recent excavations and epigraphic research there, William Folan and Joyce Marcus have concluded that the ancient city of Calakmul was occupied from the Middle Preclassic to the Postclassic periods. The apogee of the site, however, appears to have occurred during the Late Preclassic through Late Classic times, the period associated with Calakmul's numerous carved monuments. Calakmul is one of the largest known Maya sites. It is estimated to cover 70 square kilometers, and to have had a population of 50,000 during the height of its power. The central urban core of Calakmul is delineated on the north by a substantial wall, probably for defense of the most important political structures and residences. Folan and Marcus also discovered that the site is ringed by water management features including canals and arroyos, isolating a central 22 square kilometers. The area of the site open to the visitor today can be broken up into two sections (see map). The first is the Central Plaza, a large open area bounded by Structures II - VIII. The second is the Grand Acropolis, located in the northwestern quadrant of Calakmul's central core. On the south side of the Central Plaza stands Structure II. This pyramidal platform is the second largest at Calakmul, and boasts a tremendous view from its summit (see photo at top of page). It measures 140 x 140 meters at its base, and is 55 meters high. Archaeologists have excavated portions of the structure to examine its architectural history. Multiple construction layers have been left exposed for the visitor. Visible architectural levels extend back into the Late Preclassic, while the pyramid's ultimate construction phase dates to the Late Classic period. Folan and Marcus noted that Structure II is similar is size and construction to the massive El Tigre complex at El Mirador. In fact, Calakmul may be physically liked to El Mirador by way of a 38 km causeway (called a sacbe), though this feature has not been completely confirmed on the ground. A group of carved monuments stand at the base of Structure II, while others are located on and within the structure itself. 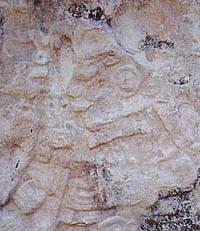 The two earliest dated monuments at Calakmul are associated with this platform, including Stela 43 (shown here). The other, Stela 114, was recently discovered within a Late Classic building on Structure II, having been relocated from its original position. At the summit of Structure II, a palace was constructed during Late Classic times. Due to excavations conducted by Folan's project, we know that this building (Structure II-B) contained nine rooms with 38 hearths, metates for grinding corn, a sweatbath, an elevated platform with niches, an altar or bench, and tombs. The Late Classic tombs were emptied in the Terminal Classic period, when a new individual was buried with bone artifacts, ceramic vessels, and a broken metate. Access to the structure became restricted at that time, and eventually it was totally abandoned. 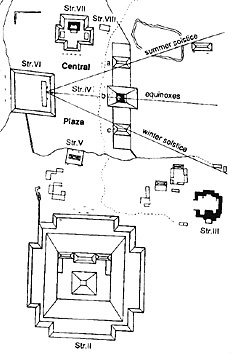 Structure VI, flanking the west side of the Central Plaza, was also initially constructed in the Late Preclassic. This structure was later remodeled, in concert with structure IV across the plaza, to create what Mayanists call an "E Group". This particular architectural arrangement was first identified at the site of Uaxactun, in group E, where the placement of platforms and structures was found to align with the summer and winter solstices as well as both equinoxes. A person standing upon the stairway of Calakmul's Structure VI, facing east, would see the sun rise on the summer solstice behind Structure IV-A, on the winter solstice behind Structure IV-C, and on the equinoxes behind Structure IV-B. Structure III, just outside of the Central Plaza to the southeast, was excavated by Alvarez Aguilar and Armijo Torres in the late 1980's. It was found to be a palace structure, housing as many as 20 to 30 people in its 12 rooms. As with Structure II-B, metates, hearths, and cooking vessels indicate food preparation areas within the palace. Unlike Structure II-B, however, Structure III was constructed in the Early Classic and was apparently built to surround an elaborate tomb. 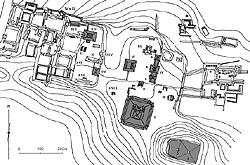 The tomb uncovered within Structure III is currently thought to date to the fifth century A.D. The burial chamber was connected to the palace above through a small duct, analogous to the "psychoduct" connecting Pacal's tomb to the Temple of Inscriptions above him at Palenque, Chiapas. Within the tomb itself, archaeologists found an adult male who was at least 30 years old when he died. The body had been placed upon a woven mat, which itself rested upon five ceramic vessels. The body was coated with the red pigment cinnabar. He wore one mosaic jade mask on his face, one on his chest, and one on his belt. Three pairs of jade earplugs, a jade ring, 32 jade beads, 3 jade plaques, 8,252 shell beads, a stingray spine, and five intricate ceramic vessels (in addition to those upon which the deceased rested) were also found within the tomb. It was the conclusion of Folan and Marcus that the tomb must have belonged to one of the early rulers of Calakmul. Unlike most structures in the Maya realm, this one did not see heavy remodeling or occupation in subsequent periods. 1996 Calakmul, Campeche. Arqueologia Mexicana 3(18):46-51. 1998 The Metropolis of Calakmul. In Maya, Rizzoli International Publications: New York. 1995 Calakmul: New Data from an Ancient Maya Capital in Campeche, Mexico. Latin American Antiquity 6(4):310-334. 1993 An Archaeological Guide to Mexico's Yucatan Peninsula. University of Oklahoma Press: Norman. 1998 Extending the Calakmul Dynasty Back in Time: A New Stela from a Maya Capital in Campeche, Mexico. Latin American Antiquity 9(4):310-327.